Scattered across a 2,200,000 sq km (849,425 sq mi) zone in the vast Pacific Ocean, roughly halfway between New Zealand and Hawaii, the Cook Islands are about as remote a holiday destination as you will find. With their pristine white-sand beaches, tranquil azure lagoons, lush tropical jungles, and teeming coral reefs, the 15 islands seem plucked from a picture postcard of paradise. Relaxation comes first and foremost, for locals as much as tourists, and you will find the laid-back lifestyle of the Cook Islanders as infectious as their warm smiles. As tempting (and fulfilling) as it might be to spend all day swinging lazily in a hammock strung between shady palm trees, plenty of adventures await exploring the idyllic scenery overland, on the waves, and undersea. 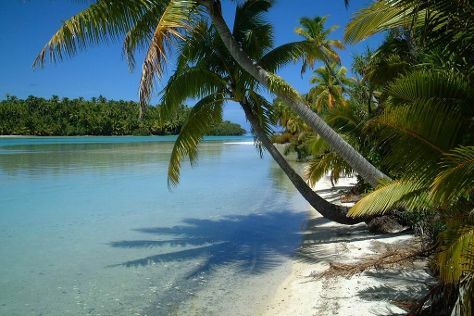 Cook Islands is in South Pacific. Plan your holiday in Cook Islands and other destinations, from the rural, to the urban, and everything in between, using our Cook Islands trip planner.